There is a magic and mystery to candlelight and certainly romance. 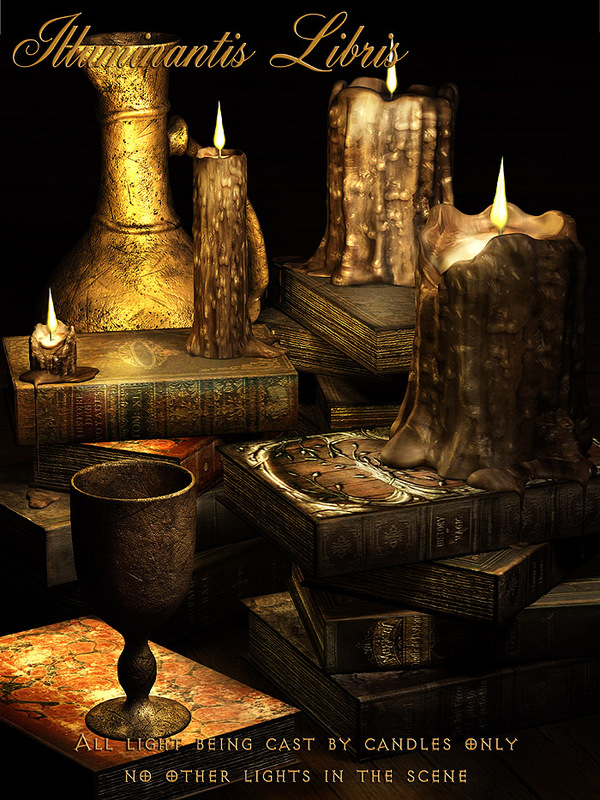 So Mortem Vetus are proud to present 'Illuminantis Libris', a collection of self-illuminating candles on piles of books. With 3 self-illuminating figures to choose from, each with a differing number of candles, as well as a selection of materials, there's plenty here to light even the darkest corners of the imagination. Also included are five piles of books with no candles, with a set of materials for changing the appearance of the piles, and build stacks of books as tall as you like, with or without candles atop them. Plus there is a single book to add touches of detail, which comes with 11 material presets. As well as a Basic Use Guide, to show how they work.